I know a tea party is to be expected when she starts bringing out her little porcelain tea set right after lunch and starts setting it up after the table has been cleared. Of late, she won't even ask if we can have a tea party. She'll just declare it and everyone is automatically invited. She'll make little sandwiches (usually peanut butter and honey which are her favorite) and serve them with whatever cookies or crackers we'd have on hand. Sometimes we'll drink hot chocolate instead of tea and other times we'd actually have tea. Today was a tea day as we had roasted barley tea that was sweetened with a touch of honey. 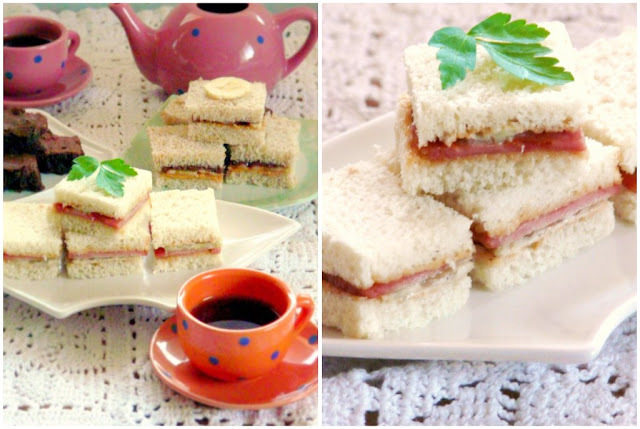 Since I had some leftover Spam in the fridge, I thought of making mini Spam sandwiches for today's tea party since we all love Spam in this household. 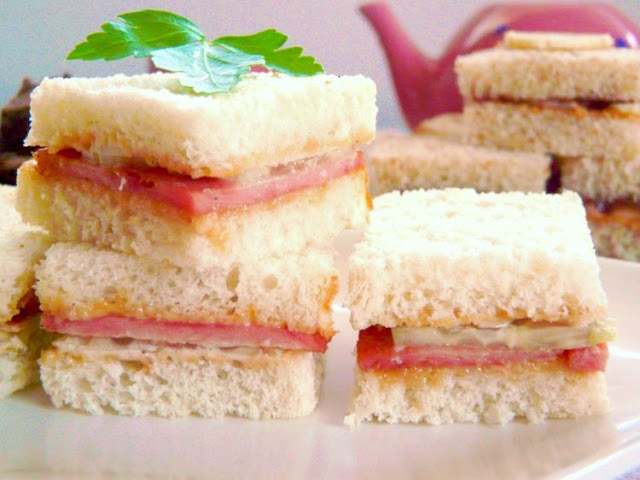 I'm pretty sure Spam is not on the top of anyone's list when they think of tea sandwiches but it should be! 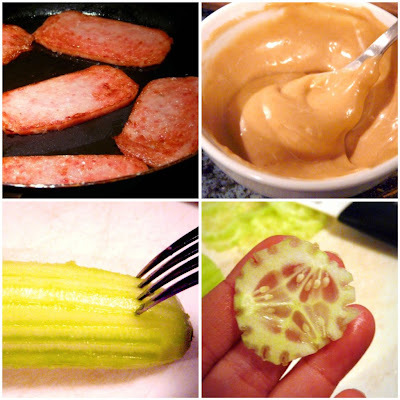 With the addition of thinly sliced cucumbers and an Asian-style creamy dressing, these little Spam sandwiches were so good, they were polished off in mere minutes. Fry the Spam slices over medium heat in a non-stick frying pan until browned on both sides. Keep an eye on them to make sure that they don't burn. When done, transfer to a plate. Mix the mayonnaise and Hoisin sauce in a small bowl and set aside. Next, prepare the cucumber. You can leave the skin on the cucumber if you prefer, especially if they are organic but with non-organic cucumbers, I tend to prefer peeling them. You can also create a prettier ridged edge by running the tines of a fork down the sides of the cucumber before slicing. Slice them as thinly as you can. Cut the crusts off the bread then spread the mayo and Hoisin mixture on the bread slices. 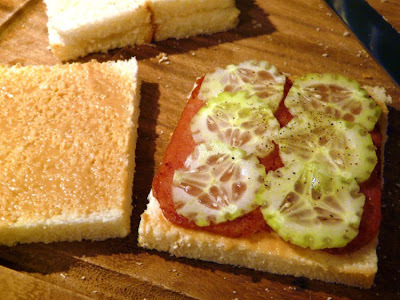 Top the bottom slice of bread with fried Spam and the sliced cucumbers. Sprinkle with pepper before adding the top slice of bread. Cut the sandwich into quarters to make them bite-sized. Arrange on a pretty plate. You can garnish with a small sprig of parsley if you'd like. 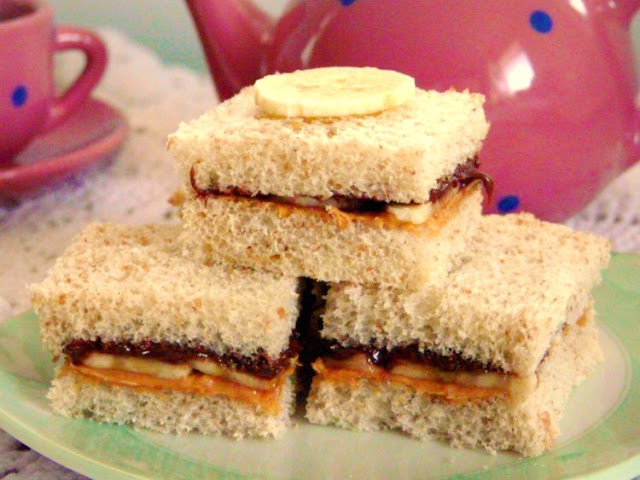 For a sweet variation, I also made peanut butter, Nutella and banana sandwiches. 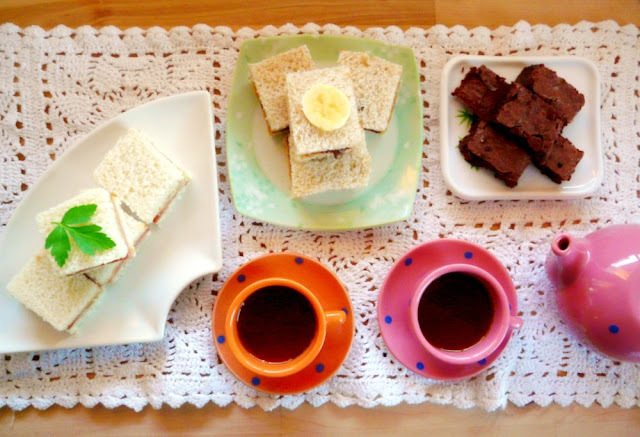 Here's our afternoon tea spread. We included some leftover brownies which we had baked the day before.